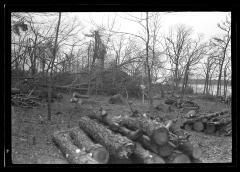 View of piles of logs in a wooded area where several trees have been knocked down by wind at North Haven in Southampton, Suffolk County on Long Island. This area is referred to as a "stock farm." This image was created to record the forest fire control activities of the New York State Conservation Department.